Welcome to Top of the World!  Top of the World Observation Level is the perfect starting point for any visit to the city and provides a breathtaking view of Baltimore's skyline, harbor and beyond. This city attraction featuring a spectacular 360-degree panoramic view of Baltimore has stationed binoculars and photo-map guides to help guests learn about local attractions, sites and neighborhoods. In addition, it is a mobility accessible attraction. Located on the 27th floor of the World Trade Center, the world's tallest pentagonal building is home to the only Baltimore attraction to offer an awe-inspiring view of Maryland's urban center. Top of the World has expansive windows that frame the Inner Harbor, the surrounding city and beyond to the Chesapeake Bay. Discover Baltimore's history through fascinating facts that make the city come alive! Please note: Ticket sales end 1/2 hour prior to closing. Hours may vary. Please view our Visitor’s page for more information.